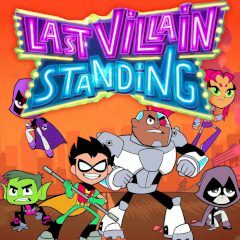 Will you be the last villain standing? Go undercover with the Teen Titans! Use Cyborg’s Doomsday Machine to smash buildings and crush the competition in an all-villain game show. Customize your mech with weapons based on Robin, Raven, Cyborg, Starfire, and Beast Boy. Battle it out until you’re the Last Villain Standing!